(1861-1925 AD). Austrian philosopher. 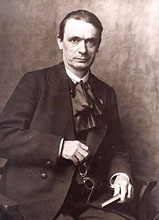 Founder of Anthroposophy. "Anthroposophy is a path of knowledge, to guide the spiritual in the human being to the spiritual in the universe�. Anthroposophists are those who experience, as an essential need of life, certain questions on the nature of the human being and the universe, just as one experiences hunger and thirst." "A nervous, that is to say excitable child should be treated differently as regards environment from one who is quiet and lethargic. everything comes into consideration, from the colour of the room and various objects that are generally around the child, to the colour of the clothes in which he is dressed...An excitable child should be surrounded by and dressed in red and reddish-yellow colours, whereas for a lethargic child one should have recourse to the blue or bluish-green shades of colour. For the important thing is the complimentary colour, which is created within the child. In the case of red it is green, and in the case of blue orange-yellow"
"To delight in art that is materialistic increases the difficulties of the Kamaloca state, whereas delight in spiritual art lightens them. Every noble, spiritual delight shortens the time in Kamaloca. Already during earthly life we must break ourselves of pleasures and desires which can be satisfied only by the physical instrument"
"WE MUST emphasize again and again that the anthroposophical world-conception fosters a consciousness of the common source of art, religion and science. During ancient periods of evolution these three were not separated; they existed in unity. The Mysteries which fostered that unity were a kind of combination art institute, church and school. For what they offered was not a one-sided sole dependence upon language. The words uttered by the initiate as both cognition and spiritual revelation were supported and illustrated by sacred rituals unfolding, before listening spectators, in mighty pictures"